Location and Geography. In a setting of turquoise waters, pink beaches and lush foliage on low hills, this small, subtropical coral island in the North Atlantic sits atop a long-extinct volcanic chain 570 miles (917 kilometers) southeast of Cape Hatteras, North Carolina, the nearest land. Only twenty-one square miles in area (fifty-five square kilometers), the island is comprised of many small islets around the Main Island and seven others that are bridged together. Bermuda is shaped like a fish-hook, the eye being Saint George's Harbour at the northeast end, and the loop of the hook forming the Great Sound at the other, leading into Hamilton Harbour. Often mistakenly associated with the Caribbean, it is in fact nearer to Nova Scotia. Protected from extremes of weather by the Gulf Stream, temperatures range between 65 degrees Fahrenheit (18 degrees Celsius) in winter and 85 degrees Fahrenheit (29 degrees Celsius) in summer. There are nine parishes named after several of the primary English 'adventurers,' or investors in the 1607 Virginia colony who separately invested in the Somer Isles company. Demography. The population of Bermuda is 62,997 (2000 estimate). Blacks have been in the majority since some point in the late eighteenth century, and now comprise between 60 and 70 percent of Bermudians. The majority of the remaining ethnic components are northern European, mainly British; they are followed by Portuguese, who are mainly of Azorean origin, and the descendants of a number of Native American tribes. While some 75 percent of Bermudians were born on the Island, many or most of those born overseas have eventually become Bermudian by marriage. Fears of permanent overpopulation and of changes in the ethnic structure have made it nearly impossible to otherwise obtain Bermuda Status (as citizenship is called). Nearly all the slaves were brought to Bermuda from the West Indies or as slaves on ships captured by Bermuda privateers. Few arrived directly from Africa. The northern European minority descend from the original English colonists and subsequent arrivals from all over Britain including indentured laborers. Some U.S. military personnel and some Scandinavians also settled here. A few Portuguese families arrived first in the 1840s from Madeira. Portuguese immigrants increasingly arrived in subsequent years to work in the growing agricultural industry. Linguistic Affiliation. The language is a blend of British, North American, and various West Indian versions of the English language. Azorean Portuguese is still spoken and preserved in some Portuguese homes. In the Bermudian accent, sometimes V s and W s are transposed; a usage that derives from the Elizabethan English of the seventeenth century settlers. Symbolism. The Bermudian flag is the British Red Ensign 'defaced' with the heraldic Bermuda Coat of Arms. The Union Flag occupies the upper, hoist quarter of an otherwise red flag and the Arms are within the red field. They consist of a white and green shield in which a heraldic red lion grasps a scroll displaying the sinking of Somers' ship Sea Venture. officer of the fleet, George Somers, and his shipwrecked sailors built new vessels and continued on to Virginia, but, enchanted by the beauty and abundant natural resources, they made plans to settle the islands. Colonization began in July 1612, when sixty British settlers, led by Richard Moore, disembarked. Moore became the first governor. In 1616, the king issued a charter to form the Somers Isles Company, a commercial enterprise. By 1620, the parliamentary Sessions House began to hold meetings of the colonial legislature. A system of land ownership developed as the territory was divided into parishes named after major stockholders in the Virginia Company. The Virginia Company ruled Bermuda much like a fiefdom and the colonists soon grew tired of the burdensome restrictions placed upon them. In 1684, Bermudian leaders sued to have the charter rescinded, and thereafter Bermuda was ruled as an English colony in a similar fashion to its American counterparts. Slaves were first brought to the islands in the early seventeenth century. Most served as laborers and domestic workers rather than plantation workers. They were often treated brutally, and several slave revolts in the seventeenth and eighteenth centuries resulted in even harsher treatment. The Bermudians launched into shipping, a highly successful industry until the advent of steam in the early nineteenth century. Taking advantage of the prolific Bermuda Cedar, they set to work to design and build the Bermuda sloops and schooners that became internationally famous. These ships were especially effective when sailing upwind or to windward. This was critical to their commercial value since they could deliver goods more quickly than their competitors. Crewed by Bermudians of all shades and degrees of servitude, they traded with ports all over the Atlantic coast of North America and the Caribbean. In wartime, armed with Letters of Marque or Warrants from the crown, they captured, depending on the war, French, Spanish, Dutch, and even American ships, bringing them to the Admiralty Prize Court in Bermuda for sale and prize money. Bermuda has been well known for privateering throughout its history. Bermuda rose to prominence in the seventeenth century as a ship building and manning center from which ships sailed to carry on trade between the colonies and islands of North America and the Caribbean. It became a post for slave trading, as well as for West Indian rum, salt, and oranges. Whaling also added to the colony's income. 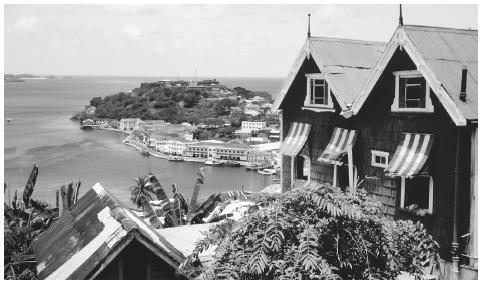 In 1815 the capital was moved from Saint George's to the increasingly busy port of Hamilton in the center of the island. As shipping declined, a new industry was needed to support the workforce, and Bermudians began to venture into organized farming. The British Emancipation Act banned slavery in the Empire in 1834, although the practice was not actually ended in the English-speaking world until the U.S. Civil War a generation later. Much of Bermuda's trade was with the southern United States. While the islands remained officially neutral during the U.S. Civil War, their sympathies tended to lie with the Confederacy. The war in fact provided a boost to business, as the South paid high prices for weapons that came through Bermuda from Britain. Northern blockades were effective, and made the trip even more profitable for sailors who were willing to run a risk. During the end of the nineteenth century, the export of vegetables, and onions in particular, provided Bermuda with a steady income. This industry fell as the United States began to produce more onions on its own soil. However, a new industry rose to take its place. Tourism brought money and development in the form of new hotels and growing towns. World War I, in which exactly half of Bermuda's contingent died, brought this fledgling industry to a standstill. After the war, there was insufficient capital to renovate the few hotels, and inadequate shipping to bring the necessary visitors. When the situation seemed most bleak, however, the Furness Steamship Company in England picked Bermuda as a destination for their new vacation ships. In the 1920s, the era of Prohibition in the United States, Bermuda became a popular escape where wealthy Americans could drink on steamships and in the hotels. In the 1930s, tourism carried Bermuda through the Great Depression with hardly a break in stride. Soon after the beginning of World War II, when Britain "stood alone," Bermuda land was offered by a desperate Winston Churchill to entice President Franklin D. Roosevelt and the U.S. Congress to come to Britain's support. Roughly 10 percent of the country was leased for ninety years to the United States, displacing large numbers of Bermudian families. During World War II, Bermuda was used as a center of Allied operations. The British Royal Navy used it as a base for patrolling the Atlantic, and the United States built naval and military bases on the islands for protection against German submarines that posed a threat to American shipping. Bermuda was an important transit point for the Allies through the war. Winston Churchill, Dwight D. Eisenhower, and the British Prime Minister Harold Macmillan all held summits in Bermuda (as did John F. Kennedy, Richard Nixon, George Bush, and Margaret Thatcher in later years). In the 1960s, racial tensions grew, as blacks began to protest unfair treatment. Grassroots movements formed to more thoroughly integrate blacks into Bermudian life. In 1968, a race riot erupted in Hamilton, caused by the perception that whites only were being given access to an overcrowded fair (they were in fact stall operators). Troops were called to Bermuda from Britain on two occasions but never were needed. In the spring of 1973, Bermuda's white governor, Sir Richard Sharples, and one of his aides were assassinated at the then unguarded Government House. Scotland Yard eventually prosecuted and obtained convictions for two of the men involved. The hanging of the two men resulted in further riots in the black communities. Injuries were minimal, but some business property was damaged. Some blacks began calling for independence from Britain as a way to end racial discrimination, and in 1977 continued political agitation led the government to discuss independence. In a vote in late 1995, Bermudians rejected a proposal of independence by a two-thirds majority, mainly in fear of opening the doors to the poverty independence brought to countries like the Bahamas and Jamaica, but also in fear of shaking the confidence of foreign firms who had invested in the country. Bermuda remains an Overseas Territory of the British crown, but the question of independence still arises. National Identity. Bermudian identity is based largely in British cultural traditions. This is especially the case for wealthy white islanders and British expatriates. Blacks, poor whites, and those of Portuguese descent identify less with the British and their institutions. Cultural influences from the United States have also impacted life here. Another ethnic group, the Mahicans, are descendants of American Indians who were brought to Saint David's Island from New York in the 1600s. They call themselves Mohawks, or "Mos" for short, and retain some of their unique cultural identity. Ethnic Relations. The divide in Bermuda between blacks and whites began soon after the colony was established, as slaves were imported to serve the needs of the colonists. The so-called "Forty Thieves" families, descendents of the original white settlers, established a system of racial segregation in both government and social life that they perpetuated for over two centuries. Even today in the profusion of Bermuda's social clubs either blacks or whites tend to strongly predominate. Over the years, blacks have achieved important gains, but racial segregation still remains a source of tension. Hamilton, the capital and largest city, is home to a number of interesting buildings, including the Anglican Cathedral of the Most Holy Trinity, built in 1894, and the Sessions House and Cabinet Building, which are the seat of government. However by far the most significant historical site is the original capital of Saint George's, a town largely unaltered since the seventeenth century. Among the many original buildings are the State House dating back to 1619 and Saint Peter's, the oldest Anglican Church in the Western Hemisphere. Housing is now cement block, to preserve the native coral limestone, which is today used mostly for roofing slate in housing construction. Architectural styles were adapted to withstand the extreme winds and hurricanes Bermuda experiences, and as a result large numbers of the eighteenth century homes survive. Steep limestone roofs are whitewashed and designed to catch water to be stored in tanks beneath the houses. Slave quarters still survive as extensions to a number of the old houses. Where space was at a premium in Saint George's, these were often ground floor with the family living above. Fireplaces, still widely popular, were an essential feature from the seventeenth through the nineteenth century, and were used as a source of heat, and for cooking and baking. The handsome and much-photographed chimneys doubled as buttresses for added roof support. Food in Daily Life. Day-to-day food is identical with that of the United States, from where much of it is imported. Traditional Bermudian cuisine is a mixture of American, British, and West Indian influences. Once abundant seafood formed the basis of many local dishes. Chowder was made from a stockpot of leftover fish carcasses and flavored with hot pepper sauce and rum. Fritters were made from now-protected conch. Hoppin' John, a meal borrowed from the Carolinas, consists of rice cooked with beans or black-eyed peas. Johnnycakes (corn-meal pancakes, served with peas and rice) are also a traditional dish. Rum is a popular drink. One local brand, Black Seal, when mixed with ginger beer, is appropriately called a Dark & Stormy. Food Customs at Ceremonial Occasions. Sunday breakfast is generally a big meal of salt codfish from Nova Scotia, egg sauce, boiled potatoes, cooked bananas, and avocado when in season. Cassava Pie is served at Christmas. It is similar to cornbread when cooked, made from minced cassava or manioc root, eggs butter, and filled with pork and turkey or chicken. Good Friday is celebrated with a traditional breakfast of codfish cakes and hot-cross buns. Sweet potato pudding is often served on Guy Fawkes Day. Basic Economy. Unemployment is virtually nonexistent in Bermuda. Roughly 15 percent of the population is made up of expatriates employed on temporary permits by employers that must first prove to the government there is no Bermudian available to fill the job. "Expats" range in qualification from dishwashers to highly qualified professionals. They and their dependants are significant contributors to the economy. Of the workforce, the vast majority are in professional or administrative work or services; only 2 percent are engaged in agriculture and fishing. Farmers produce bananas, vegetables, citrus fruits, flowers, and dairy products, but agriculture is limited by the fact that only 6 percent of the country's land is arable. Land Tenure and Property. Bermuda's twenty-odd square miles are taxed on a progressive scale according to the assessed rental value. To protect Bermudian ownership, foreigners may only purchase at the top end of the scale, and only with permission. Corporations may only own the land allowed by their incorporating act. There is also public land, including several nature reserves, parks, and historic sites. Commercial Activities. Most commercial activity revolves around the tourist industry. Hotels and restaurants, golf courses, and tour companies all cater to the constant influx of visitors (84 percent of whom come from the United States). Most of the goods sold in Bermuda are imported, and therefore costly. Major Industries. Bermuda's dominant industry today is financial, and includes some of the world's largest re-insurance companies among other corporate enterprises of all kinds. The only restriction at this time has been a reluctance to accommodate foreign banks, for fear of losing local financial control. The earnings in this sector are now twice that of tourism, and as tourism has declined, the new housing and general services required by these corporate enterprises have absorbed much of the workforce once dependent on tourism. Trade. Bermuda imports machinery and transportation equipment, construction materials, chemicals, food products, and live animals, primarily from the United States, but also from the United Kingdom and Mexico. The country's main export is pharmaceuticals, which are not processed in Bermuda, but merely stop there in transit. Bermuda also exports perfume, liqueurs, and Bermuda lilies (which are popular in the United States as Easter lilies) mostly to the United Kingdom and the United States. Division of Labor. There is no shortage of jobs available, and people are free to choose their own professions. Blacks tend to occupy more of the lower paying positions than whites. Business ownership is substantially white, although board membership, and thus control of business, has become more diverse. Houses overlooking St. George's Harbor. St. George's is the most historical city in Bermuda, with an abundance of seventeenth-century architecture. have made progress in entering the government and civic life. Symbols of Social Stratification. In general, attire is fairly formal. The famous Bermuda shorts, a legacy of the British Army's uniform, are worn by businessmen, along with jackets, ties, and knee socks. Otherwise, dress is similar to in the United States or Britain, and there are few distinguishing features among classes. Government. A 1977 constitutional conference effectively gave Bermuda full internal independence. Today, with a Westminster based parliamentary system of government, Bermuda has forty elected members in the Assembly. These choose the premier, and the premier selects a Cabinet of Ministers, each with a ministerial responsibility ranging from fiscal to education and health. The Senate is an appointed assembly, five seats by the premier, three by the opposition party, and three by the governor, of whom one is the president. The Senate cannot debate tax bills and may only delay others. Leadership and Political Officials. The Governor acts as Queen Elizabeth II's representative, as an advisor, and like the Queen has little actual power. The present ruling party is the Progressive Labour Party (PLP), almost entirely African Bermudian and formed in 1963 with those interests at heart. The PLP won power in 1998 after some thirty-five years in opposition. Prior to this, the multi-racial United Bermuda Party (UBP) held a majority, with overwhelming support among the white population and a significant percentage of blacks as well. Social Problems and Control. Crime is dominated by drug-related offenses. Guns are prohibited, and violent crime is relatively rare. The legal system is based on that of Britain with Magistrates and a Supreme Court and Court of Appeal. The Privy Council of the British House of Lords is the final arbiter. The Supreme Court still retains the traditional British robes, wigs, and format. There is a maximum-security prison and a more relaxed prison farm. Military Activity. Britain assumes responsibility for the country's defense. The military consists of the Bermuda Regiment and the Bermuda Reserve Constabulary. 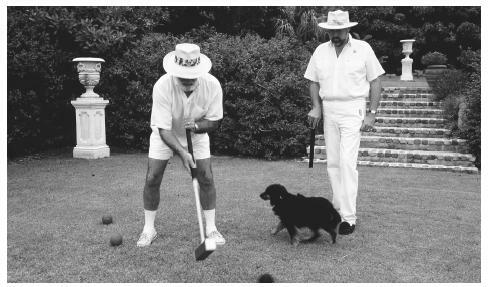 Two men playing croquet. Bermuda is an Overseas Territory of the British Crown. In 1965, funding for formalized pensions for all over the age of 65 was established and is paid for from payroll deductions. In 1997, legislation to substantially expand pensions was launched and now is in effect. Bermudians have basic hospitalization coverage, and employers customarily provide enhanced medical programs for all employees. There are a large number of charities and service clubs active in Bermuda. The primary Bermudian provider of funds is the Centennial Trust of the Bank of Bermuda, which has donated nearly seven million dollars (U.S.) over ten years to numerous charities and organizations. The large international business sector provides significant funds. The two larger banks, the government, and many other interests provide comprehensive scholarships. Division of Labor by Gender. While women are still responsible for most everyday domestic jobs, in Bermuda they are widely represented in all aspects of business and the professions. Most senior executives are still male, but significant top positions in business and the civil service are, and have been held by women. The present and previous premiers are women. The Relative Status of Women and Men. Women and men are equal in law; this is widely respected by employers and in most areas of society. Marriage. Religious ceremonies are followed by large receptions. The traditional cake is three-tiered, with one layer for the bride, one for the groom, and one that is served to the guests. The cake is topped with a cedar sapling, which the couple then plants at their new home. Domestic Unit. The domestic unit generally consists of the nuclear family. There is a considerable acceptance of single parenting. To be successful, and to provide role models for young males, this usually requires strong support from siblings, grandparents, and aunts and uncles in the wider family. There is often difficulty in realizing court child support rulings, and much remains unpaid. Inheritance. While inheritance was once limited to the male line, today women as well as men are legally entitled to inherit property. Infant Care. Infant care is generally the domain of the mother, although those of the upper class often hire nannies. Child Rearing and Education. Bermuda is well equipped with nursery and preschools set up to accept children of working mothers. Education is free and mandatory between the ages of five and sixteen. The school system is based on the British and American model. Several large private schools, once segregated, still lean to one race, religion, or the other. The literacy rate is near 100 percent. Higher Education. Bermuda has one junior college, which enrolls about six hundred students. To obtain a four-year degree, it is necessary to leave the islands, and the government and private organizations provide scholarships to study in the United States, Canada, and the United Kingdom. Religious Beliefs. Thirty-nine percent of the population is non-Anglican Protestant; 27 percent is Anglican; 15 percent is Roman Catholic; and 19 percent practice other religions. Methodism first came to the islands in the mid-eighteenth century, and attracted a large percentage of the islands' black inhabitants. The African Methodist Episcopal (AME) church has historically been a significant unifying force in the black community. Catholicism first began to make inroads in the mid-nineteenth century, bolstered by the influx of Portuguese immigrants. Religious Practitioners. The Archbishop of Canterbury in England is the central religious figure for members of the Anglican Church. The Bishop of Bermuda, who presides over the Anglican Cathedral in Hamilton, is next in the hierarchy. The Anglican church in Bermuda has many black pastors, including the bishop, and numerous black congregations. Rituals and Holy Places. Bermuda has a number of historic churches. The oldest, Saint Peter's Church in Saint George's, was originally built in the early 1600s, and later rebuilt in 1713. The Anglican Cathedral in Hamilton is an elaborate Gothic structure with stained-glass windows and British oak sculpture. The Presbyterian Church in Warwick dates to 1719. Death and the Afterlife. Both Catholics and Protestants believe in an afterlife. Funeral services in the church are generally followed by mourning in the home of relatives of the deceased. The standard of health care is high. There are two hospitals on the islands, one medical and the other psychiatric, and there are adequate doctors to provide care for most of the population. There is an air-ambulance service to the United States and established medical relationships there, in Canada, and in the United Kingdom provide specialist care not locally available. Bermuda has a low infant-mortality rate, and life expectancy is seventy-five years for men and seventy-nine for women. Holidays celebrated include New Year's Day, 1 January; Bermuda Day, 24 May (Queen Victoria's birthday); the monarch's official birthday, usually the third Monday in June; the two-day cricket, or Cup Match held on a Thursday and a Friday at the end of July or beginning of August; Labor Day, on first Monday in September; Armistice, or Remembrance Day, 11 November when wars are remembered; and Boxing Day, 26 December. Literature. Bermuda has produced a number of writers remarkable mostly for historical and cultural studies of the islands, including Walter B. Hayward, Dr. Henry Wilkinson, William S. Zuill, Terry Tucker, Nellie Musson, Cyril Packwood, and Frank Manning and Brian Burland. Bermuda has also provided refuge and inspiration for writers from other countries, including Mark Twain, Eugene O'Neill, Munro Leaf, Noel Coward, James Thurber, Vernon Ives, and Peter Benchley. 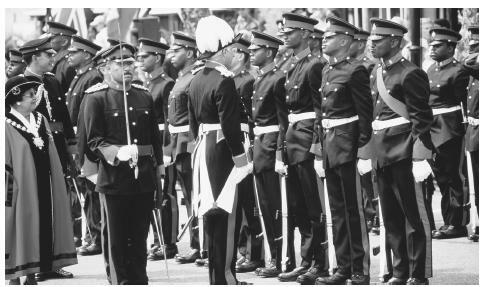 The Governor of Bermuda inspects troops of the Bermuda Regiment during the annual Peppercorn Ceremonies, St. George, Bermuda. Theatre and the Ruth Seaton James Hall at Prospect present numerous local and traveling productions. Many local painters and sculptors have found a market in the tourist population. Much of their work takes its inspiration from the natural surroundings; watercolor is perhaps the most popular medium. Well-known painters include the late Alfred Birdsey, his daughter Joanne Birdsey Linberg, Carol Holding, and Joan Forbes. Desmond Fountain is the country's best-known sculptor. Performance Arts. The Bermudian variety of Gombey, of West African origin but influenced and made unique by the early strong Native North American presence, has been passed down in family groups over centuries. Accompanied by rhythmic drums, wielding bows, arrows, and tomahawks, the dancers, including children, sport peacock feathered headdresses, masks, and capes. Many of the dances relate to biblical st. The four main Gombey troupes perform on Boxing Day and on unscheduled occasions throughout the year. West Indian calypso and reggae music are both popular. The Bermuda Biological Station for Research (largely funded by the U.S. National Science Foundation) has laboratories and a library for the study of marine life and environmental issues such as acid rain. There are several including the Maritime Museum complex within the restored Royal Naval Dockyard at Ireland Island. The Bermuda Aquarium and Museum is privately and government supported; it is world famous. Adams, John. "The English Peopling of Bermuda," The Bermudian Magazine, special Heritage edition, May 1992. ——. "The Mixture of Races in Bermuda," The Bermudian Magazine, special Heritage edition, May 1992. Boultbee, Paul G. and Raine, David F., compilers. Bermuda, 1998. Craven, W. F. Introduction to the History of Bermuda, 1938; rev. ed., 1990. Davies, Elizabeth W. The Legal Status of British Dependent Territories: The West Indies and the North Atlantic Region, 1995. Ebbin, Meredith. "Women's Task Force Seeks Major Changes." The Bermda Sun, 24 December 1996. "Gimme Shelter." The Economist, 1 January 2000. Hendrick, Basil C. et al. Anthropological Investigations in the Caribbean: selected papers, 1984. Lefroy, Major General J. H., CB, FRS, RA. 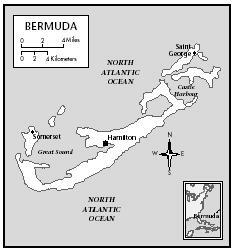 Discovery and Early Settlement of the Bermudas or Somers Islands, 1515 – 1687, 1981. Mudd, Patricia Marirea. "Bermudians of Portuguese Descent," The Bermudian Magazine, special Heritage edition, May 1992. Packwood, Cyril Outerbridge. Chained on the Rock: Slavery in Bermuda, 1975. ——. "Origins of African Bermudians," The Bermudian Magazine, special Heritage edition, May 1992. Theriault, Tania. "Women in Politics." The Bermuda Sun, 14 October 1998. Tucker, Terry. Bermuda: Today and Yesterday, 1503-1973, 1975. Ward, W. E. F. The Royal Navy and the Slavers—The Suppression of the Atlantic Slave Trade, 1969. Wilkinson, Henry Campbell. Bermuda from Sail to Steam, the History of the Island from 1784 to 1901, 1973. Ziral, James A. "People of the Great Spirit," The Bermudian Magazine, special Heritage edition, May 1992. ——. "Who Are We?" The Bermudian Magazine, special Heritage edition, May 1992. The island of Bermuda is colony of what nation????????????????? and I would be grateful if you could advise me as to how to acquire this information. intersting i liked so much that i read it to my family and they liked it to even though my 8 year old had no clue what some of it met. As a new comer from the UK, and likely to reside here for three years, I found this article one of the most concise and helpful insights into Bermudian life and culture. It contained information (such as local authors and artists, food and social customs) which I had not found elsewhere. Thank you from researching, and making available,this information. Hi, I really need to know the religion for Bermuda, will you please tell me. This year my mother, Elaine Clara Jackson-Morris will celebrate her 95th birthday on March 24th. She is the daughter of the first black Lawyer of Bermuda, Eugenius Charles Jackson. Elaine, the youngest child-her father and mother had to leave Bermuda causing her to be born in the USA. Her Life's Dream was to acquire her Bermudian Citizenship. Can you offer any suggestions? I am researching my family past on my grand mothers side. I've got back to 1829 and want to get some information about J.Tucker who was the slave master of Sarah Smith(Paynter) also Susanne Dickinson (Paynter) who was a slave of Richard Higgs 1830. Adelaide Paynter and Susan Whitney was free slaves in 1834 but don't know any thing else. Was told by members family that in past few generations ago that my family was sent to Bermuda Island by Portugal as criminal unsure if they was just dropped off at the island or were prisoners. the whole family that included both parents and their 14 children. Years later grown children were freed after either meet the punishment serviceor until their parents passed then all the children moved out of the island to either Portugal or Azores or America that's where my great grandfather went to (America). I am curious where can I find more informations about that. I visited your beautiful island in the mid 60s while on a college trip. I loved your enchanting moon gates and all the flowers and beaches. I've never forgotten that trip. I was in a woman's singing group and we literally sang for our supper at several locations during our week's stay. I found this article very interesting and informative.